Make your Dorchester home is a comfortable place to live once more with the dry rot treatments supplied by Prokil. Our fully trained and certified team are adept at identifying and remedying the effects of dry rot and have assisted thousands of domestic and commercial customers over the years. For the most reliable treatment for dry rot in Dorchester, do not hesitate to pick up the phone now. What are the causes of dry rot? Where damp conditions are prevalent, dry rot can often be found. The result of an infestation of the Serpula Lacrymans fungus, dry rot will quickly spread digesting the timbers of your property and leave them structurally weakened throughout. The results if left unchecked can be severe, and will place your family and home at serious risk. Dry rot is commonly found in overly humid environments or areas of your home where water is allowed to seep through. As such, common causes for dry rot are typically related to structural, drainage and plumbing issues including damaged rooftops, blown window seals and leaking pipes. Should any of these issues be present and you suspect that dry rot has taken hold, do not hesitate to call Prokil as we provide a complete dry rot treatment in Dorchester. Most of these signs occur fairly early on except the odour, which develops in the later stages and is an indication of long-lasting damage. What can Prokil do for you? 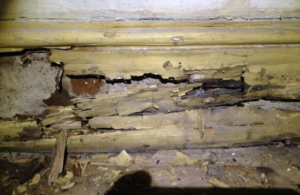 When dry rot is suspected, we strongly urge you to give us a call and setup and an appointment with our team. We’ll visit your property at a time that is convenient for you and carry out an in-depth survey of all affected areas. Once we’ve established the extent of the problem, we will supply you with a complete report that details our findings and any associated costs. From correcting structural issues and repairing damaged pipes to removing any sources of moisture, we leave no stone unturned. Once the source of the water has been dealt with, our dry rot team in Dorchester will replace any damaged timbers with pre-treated materials and treat any unaffected woods with a powerful fungicide. So, don’t delay and call Prokil today if you are at all in doubt about the presence of dry rot in your Dorchester property.